rest in the afternoon, I dream about my fall garden. them to a more conducive place in the garden. my new fall vignette on the sofa table. three vases with hydrangeas drying. I follow the decorating rule of "have things you love in your house." I do love my wildlife artwork. spot to decorate and dry my blooms at the same time. I have tried different methods of drying the beautiful blooms. This method has worked best for me. Fill a vase with a small amount of water. and the water has evaporated. home into my most favorite time of the year. So delighted you came visiting today. Have a wonderful week, I'm waiting for cooler weather too! Lovely vignettes! 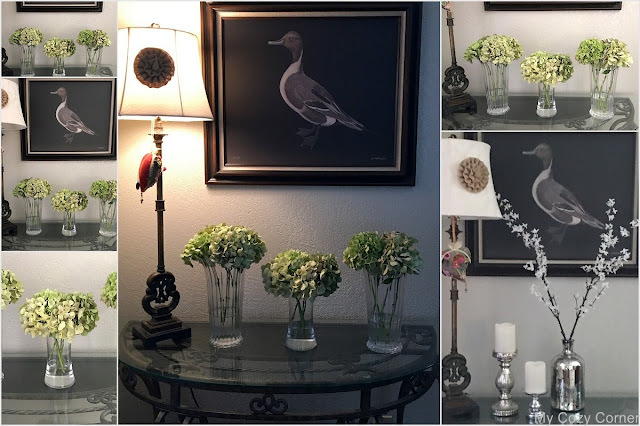 Your hydrangeas look perfect there under the print and the lighting from the lamp gives a soothing glow. Our weather is playing with us.. it dipped down to 82 for two days yesterday and today will soar up to mid nineties again for the next week....not nice!!! So today I am getting out and clearing the tangle of vines and weeds form a garden and planting a couple of fall type flowers.... hope I get it done... Love your vignette and the hydrangeas.